The Hop On, Hop Off style tour buses are your best friend when you are traveling in a time crunch. They allow you to see the most of the city in a short span of time, and you can pick and choose where you want to spend a little extra time. It is also a very inexpensive way to see an entire city. The way they generally work is this: they have a pre-defined route (or routes) with pre-defined stops. They generally run multiple buses at a time so that a bus will show up at each of the stops every 15-60 minutes, depending on the popularity of the stop. You can either stay on the bus, or get off at any of the stops, and then get back on again when you’re ready to continue. They usually also include an audio guide with translations in most major languages. The most popular passes give you 24 hours. Read the reviews ahead of time. This is the best way to learn if they have issues with timeliness, cleanliness, translations, shortage of buses, or other features. I’ve avoided a lot of potential problems this way. Plan your schedule ahead of time. All reputable tours offer a map of their routes as well as the timeframes that the buses stop at each of the points. Decide ahead of time which areas you will find sufficient to simply “drive by” and which ones you are going to want to spend some time at. If you’re stopping at a place that includes a tour, make sure you know how long the tour is. It is also important to know when major attractions close, so you don’t arrive and then have to leave immediately (some museums for example, close around 3 or 4). If you don’t want to stop at any of the points along the way, then make sure you know how long the full tour lasts (usually 1-2 hours). Helpful hint: most of the companies have their maps and routes online. Research the best stops to board the bus. This is something I learned the hard way. Not all of the stops are created equal. If possible, try to board the bus at the original starting point when you are first getting on the tour. You can board at any of the stops usually, but often times you’ll be waiting for a bus and when it stops it will be full (or no good seats left). Buy the 24-hour pass. I am still not entirely sure why they sell passes for 1-2 hours, as taking the local bus/train/rail is cheaper and easier. You’re going to need more than two hours if you plan to make any “hop off” stops along the way. Also you can use it for transportation throughout the city if you need to go somewhere later. Take the tour twice, maybe. This goes back to the tip about good seats. Jumping off the bus doesn’t always mean you’ll be able to get back on the bus as easily. If you have the time, it can be best to do the entire tour loop once, in a good seat (to get all of your “drive by” pics out of the way), and then board again and use it as transportation to the stops you want to spend more time on. Another thing you can do is take a tour during the day, and then again at night so you can see the destination lit up as well. If you buy the full day pass, you may as well use it as your transportation if you can! Understand what your ticket includes. Tours often have 2-3 different routes, and sometimes the tickets include passage on all routes and sometimes they do not. Sometimes they will offer tickets for all routes for a slightly higher price, which is tempting to buy, but make sure that you’re actually interested in what is on the other routes, as they often include less popular sites. 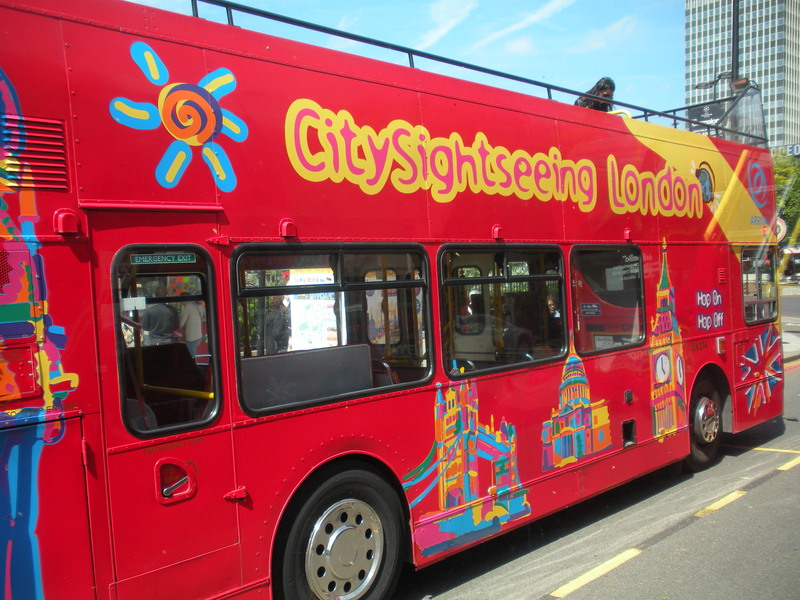 They may also include non-bus perks too (in London, for example, some of the tours include a boat ride on the Thames). Your ticket may also include discounts or coupons to tours or restaurants. Remember what your bus looks like! Not all of the buses are bright red with colorful designs. Sometimes they look just like regular coach buses. At larger destinations, there can sometimes be dozens of buses. It’s also not always just as simple as knowing what company you’re with, either, as the different routes use different buses. I’ve actually taken a picture of my buses before. Know where you can buy the tickets. Some companies allow you to buy passes from any of the buses and any of the stops, but others require you to buy it at a specific location. Others still might allow you to buy them online but some will still require you to pick them up a specific place. Learn the busy times. If you have the choice of time and day, research when tourism is at its quietest…day of the week, time of day, etc. It can be stressful managing the buses during the busiest times. Also, buses aren’t exempt from traffic and avoiding rush hour can mean avoiding some real headaches. Of course, you don’t always have this choice. I should add that even if you are on a longer trip where you have more time to spend, these tours are a great introduction to the city. It gives you a chance to see a preview of everything available to you, and even helps you better prioritize where to spend your time, how to get there, and the proper distances between landmarks. Whatever your time and agenda, they can be a quick and budget-friendly way to see any major city.